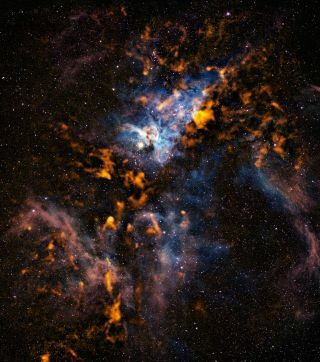 This image of the Carina nebula reveals the cold dusty clouds from which stars form in the bustling stellar nursery. Thousands of astronomers and space scientists from all over the world will descend upon Austin, Texas next week for a conference that is being billed as the "Super Bowl of Astronomy." The 219th meeting of the American Astronomical Society (AAS) is one of the year's largest astronomy conferences, and will feature new discoveries about alien planets, dark matter and more. The meeting, which will be held at the Austin Convention Center in downtown Austin, kicks off on Sunday (Jan. 8) and runs through Jan. 12. More than 2,700 registered astrophysicists, educators and students are expected to be in attendance at the five-day event, ranging from Nobel Prize winners to undergraduates and even some high school students, AAS press officer Rick Fienberg told SPACE.com. In addition to the announcement of new discoveries, the meeting will act as a forum for discussing the hottest topics in astronomy at the moment. "Exoplanets will be one — we have exciting discoveries there," Fienberg said. "Dark matter and dark energy are two of the most important frontiers right now, and we have some interesting things happening there. Beyond that, I think it's hard to anticipate what will be the biggest story." Several town hall-style meetings will also be held, where contentious budget and policy discussions about NASA, the National Science Foundation, the James Webb Space Telescope and the National Optical Astronomy Observatory will take place. "There's a lot of interest in policy right now because of the budget crisis, so there will be a lot of interest in the presentations made at the town hall meetings," Fienberg said. A host of invited speakers will also give lectures on supernovas, galaxy formation and the accelerating universe. The annual winter AAS meeting typically rotates between four host cities, so it was last held in Austin in January 2008. The Texas hub provides a fun and exciting backdrop to the astronomy goings-on, Fienberg said. "Austin is a great city to meet in," he said. "It's affordable, the weather is nice in the winter, there's great food and great music. Everybody likes coming to Austin." Visit SPACE.com for full coverage of the discoveries announced at the 219th meeting of the American Astronomical Society. Twitter users can follow along with the hashtag #AAS219.